I notice from an earlier post that it's been almost exactly a year since our last trip to Kingston. We went there this weekend on a new-kitchen-related mission (the kitchen seems to occasioning a fair bit of mileage at the moment) and, as last year, we came back on the Glenora Ferry. It isn't quite as hair-raising a trip as the picture might suggest! 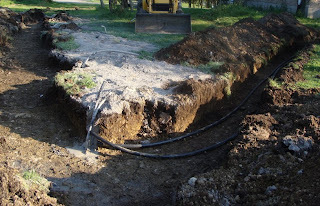 Work began again on the geothermal system this morning. I had just started a load of washing when the men and machine arrived, so had to use the dryer for once as putting it on the washing line would have caused the driver of this digger a few problems. They are linking up the holes that were drilled last week with the unit in the basement. The forecast for next week is for it to get very hot again, so I'm hoping they'll have it all hooked up by then so that we can test its cooling capabilities. 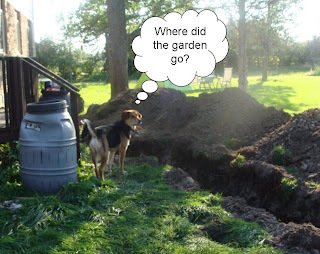 Where it certainly confused the dog. All power to your elbow and wishing you lots of stamina! If we didn't have central air here I don't think I'd make it with asthma! In East Texas it's terribly humid and hot. How exciting! I'd never twigged that geothermal could be used for cooling as well as heating - durrr!